Secure Shell (SSH) is a TCP/IP service that provides a secure mechanism for remotely logging into one system over either a local network or the internet from another system. SSH also provides the ability to transfer files between remote systems. When a user logs into a remote CentOS 6 system using SSH, they receive a command prompt allowing them to enter commands on the remote system as if they were sitting at the remote system and had opened a terminal session. In this chapter we will cover the steps necessary to configure a CentOS 6 system to accept SSH connections. 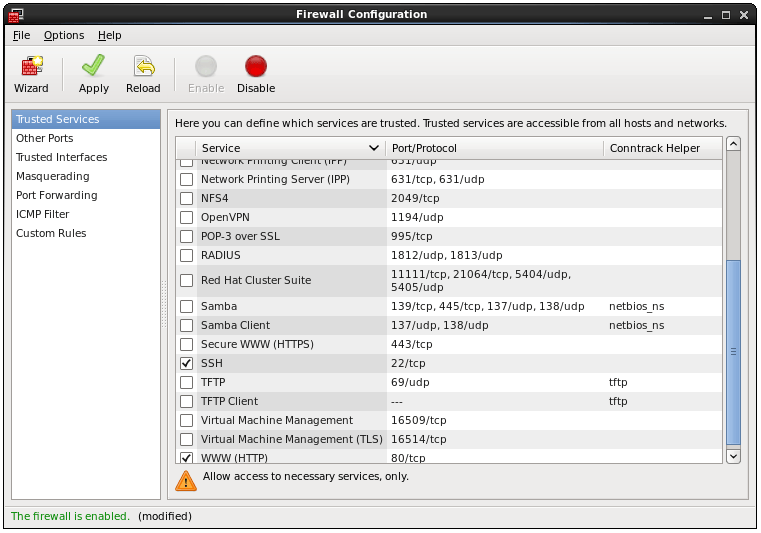 This involves installing the SSH server on the remote system and configuring the firewall to allow SSH connections. The installation process will download the SSH server, install it and start the service running in the background. You may now attempt to connect from a remote system (see below for details of how to do this). If you receive a "connection refused" message when you try to connect you may need to configure the firewall to allow SSH connections to be established to this system. The service may also be started by using the GUI Service Configuration tool accessed via the System -> Administration -> Services menu option. Once the tool has loaded, simply scroll down the list of services until you reach sshd. Select it and click on the Start button located in the toolbar. To connect from a remote system, perform the same steps above using either the IP address or host name of the remote host to which you wish to connect. Enter your password when prompted and you will find yourself logged into the remote system. Where myfile.txt is the name of the file to be uploaded to the remote system, username is the name of user account to be used to log into the remote system, 192.168.2.21 is replaced by the real IP address or hostname of the system and /home/demo represents the directory into which the file should be copied. Select the sshd entry and click on the Stop button. The SSH server is now stopped. If you wish to prevent the service from starting automatically next time the system starts, click on the Disable button.